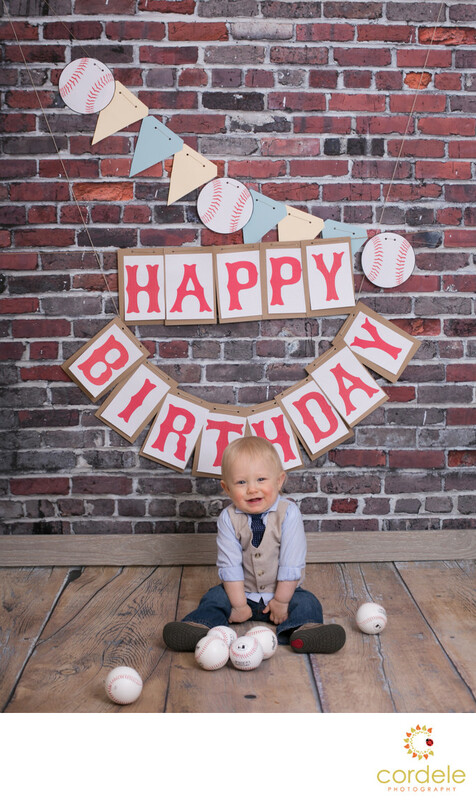 Finding a Lynnfield Massachusetts Photographer to photograph the First birthday of your baby is easy! Here we have an great photo that was easy to pull together with little effort by mom. There are times I look back and wish I had thought to do this kind of session with my own kids! I love Baseball and this portrait session is for the Red Sox fan at heart. With the birthday banner behind him and the baseballs on the floor it screams BOY! This is just one of the themes we can pull of for Baby's First Birthday Cake smash Session. We have done all sorts of other themes from glitter shoots, to baseball, to animals, to colors. If you can dream it up, we can pull it together. You tell us the theme and we will help you find the perfect backdrop and props to go with it.